What if machines can see music….? If AI can see music, how would it be look like? Machines can learn human behaviors and contents. With Strong AI, machines can recognize images, voices, text, sound etc. which means beyond time dimension. We listen music as time series, but machines can analysis and re-organized it upon its sonic feature distinction. Therefore, my question is, what would music look like with machine’ perspective? 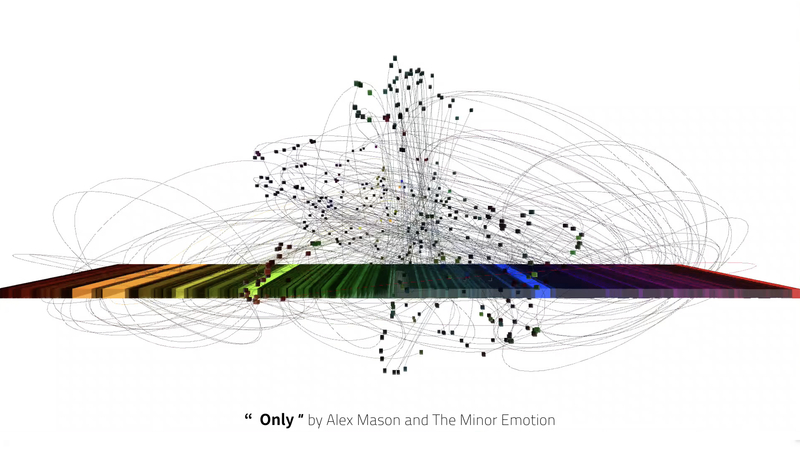 This project, “What if machines can see music…?” visualizes similarities and relationships of many audio chunks from a single audio track. 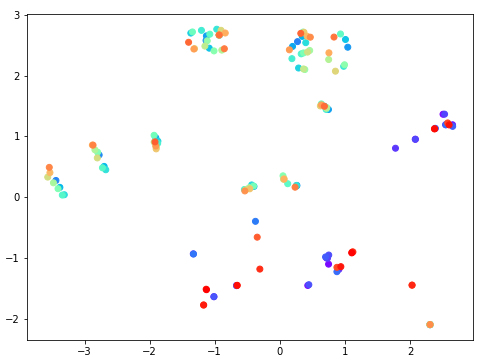 and how those chunks are related to each other (via clustering). And also, you can listen those chunks as time series. each music file can have its own from and figure. Can machines be creative? Yes, I guess. because machines can see the world not like human does and never like human can image. This is machine singularity which human doesn’t have. This project has been selected NIPS Machine Learing for Creativity Workshop exhibition, 2017. 1. As input, a single audio track (a song) into many audio chunks. 2. Those chunks happened according to the beginning of discrete sonic events in the input audio. 3. With librosa lib( mel-spectrogram), features are extracted from those audio chunks. 4. as result, 26 features from each chunk. According to mel-spectrum analysis, one audio file can be chunked in many smalls according to its sonic events. 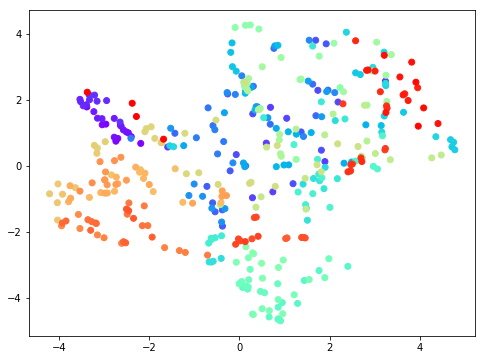 With t-sne algorithm, those chunks are clustered according to its feature similarities. Colors are applied to first chunk to the last, from red to purple. (rainbow color). From this 2D visualization, we can recognize intro part(red group) and ending part (purple group) are distinguishable from the rest. 1. Visualizing high dimensional data in low dimensional space. 26 features of audio chunks in 3D space with t-sne. 2-1) first track : as time order, all the chunks are shown at the bottom. The size of each box represents the length of the audio chunk. 2-2) second track : place the audio chunks in 3D space according to its feature similarities with other chunks. 3. Sound : play each chunks according to its time order. 4. As result, every audio file can have its own form and shape. After testing a classical music, I have expanded my exepriment to more various genres such as electronic, contemporary, of course pop music.